Between 1900 and 1901, the sponge divers retrieved a string of stunning antiquities, including weapons, jewellery, furniture and some exquisite statues. 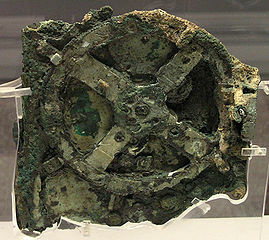 But their most famous find was a battered lump that sat unnoticed for months in the courtyard of Athens’ National Archaeological Museum, before it cracked open to reveal a bundle of cogwheels, dials and inscriptions. It has taken scientists over a hundred years to decode the inner workings of those corroded fragments, with x-ray and CT scans finally revealing a sophisticated clockwork machine used to calculate the workings of the heavens (video). But one of the most intriguing mysteries relates to the wreck on which it was found. What’s still down there? The wreck lies in around 60 metres of cold, rocky, current-swirled water – not an easy place to visit. The sponge divers who salvaged its cargo worked in clunky metal diving suits with little understanding of the dangers of diving at such depth. By the time they abandoned their project, two of them had been paralysed by the bends, and one was dead. They left behind stories of abandoned treasures, including giant marble statues that rolled down the steep slope from the wreck and out of reach. The undersea explorer Jacques Cousteau spent a couple of days at the wreck site in 1978 and brought up some precious smaller items, including some coins from the Asia Minor coast, which suggested that the ship sailed from there around 70-60 BC (probably carrying war booty from Greek colonies back to Rome). But even with their sleek scuba gear, Cousteau’s divers could spend only brief minutes on the seabed without risking the bends. No one has been back since. Now, after years of negotiations with the Greek authorities, Brendan Foley, a marine archaeologist based at Woods Hole Oceanographic Institution in Massachusetts, finally has permission to dive at Antikythera. He’s working with Greek archaeologists including Theotokis Theodoulou of the Ephorate of Underwater Antiquities. This week, the team begins a three-week survey using rebreather technology, which recycles unused oxygen from each breath and allows divers to stay deeper for longer. The aim is to survey the wreck site properly for the first time, to find out once and for all what has been left down there – and to check down the slope, to 70 metres depth or more, to see if those stories of runaway statues are true. And, of course, what if there is further ancient technology just sitting there, unrecognised? He has an office at the Jerusalem Patriarchate, he’s restored the Alexandrian Patriarchate’s library (along with financial help apparently from my friend Harry Tzalas a former Greek resident of Alexandria). Tselikas has done more for the restoration of Byzantine manuscripts than any living person in the world right now. Just giving you some perspective on the man behind this project. Useful and interesting – thank you!